The gambling debate in NH is as hot as it has ever been as the NH Senate just passed a casino gambling bill. Since I have no dog in the fight (or more appropriate to the debate – no pony in the race) I’ll use this blog to add my $.02. I think the issue will be decided largely on the basis of something other than the impact casino gambling would have on state revenues, but to the extent that fiscal impacts are a part of policymaker’s decision process I’d like to see them have access to the best information and tools with which to make their decision. Public policy analysis is not physics, there aren’t formulas with constants that govern behaviors today the same way they did one million years ago. Policy research is mostly social science that relies on a combination of disciplines like economics, sociology, and demography, and others. The goal of policy analysis isn’t to prove anything or have something published in an academic journal (a fact usually lost on academics) it is to improve the information in the debate and to marginally improve the decision-making process. Policy research is best when it not only provides information, but also when it increases policy maker’s understanding of the issue and how even small changes in policy proposals might affect the ultimate impact of a proposal. A lot of lobbyists want to provide the one “answer” to what will be the impact of this or that proposal or what will be its fiscal costs or benefits. A lot of lawmakers want a single “point estimate” of impacts as well, when in fact there is always a range of likely impacts (some more likely than others) and usually they depend on a set of assumptions. I’ve done a lot of policy research and I never assume anyone will agree with any of the assumptions I include in my policy models so I always design them for policy makers to insert their own assumptions in order to calculate the impacts of policy proposals. That both increases the confidence policy makers have in their decision-making by helping them understand the sensitivities of estimates to different assumptions and the key determinants or levers that produce different impacts, and it reduces concerns that my analyses are using unrealistic assumption or “cooking” the numbers. But what it really does is provide a ‘tool” for policy makers to use rather than giving them my “answer” to any policy question. I usually do have my preferred answer but it doesn’t do any good unless lawmakers can see that it isn’t just “my preferred answer” bu the result of some pretty sound empirical analysis, even when it can be interpreted differently. Invariably I offer to make my models available to policy makers but to date at least, only a few have every taken my up on it. With that long preface I’d like to suggest that all sides of the gambling debate make their models and assumptions available and allow policy makers to get a better understanding of the sensitivities of their estimates to different assumptions. My friend Dennis Delay at the NH Center for Public Policy Studies is about the best there is at shooting straight and trying to develop the best estimates possible but while he does the analysis I don’t think he does all of the report writing so I would like to see more attention in their analysis of gambling to demonstrating likely impacts under a range of assumptions because it seems that not everyone agrees with theirs. I haven’t seen any detailed analyses by gambling proponents and think they need to provide their assumptions and models for estimating revenues and impacts as well if they want lawmakers to adopt their proposals (they may have done this I just haven’t seen any analysis). To demonstrate how important assumptions are in estimating revenues I developed a small model of gambling revenue in NH (not including any social costs). The model results presented below assume one casino in Southern NH with 5,000 slot machines (or video lottery terminals) but any number of slots can be entered as a variable. The base for state revenues (on which a state tax would be applied) is estimated using per slot machine revenue data from Connecticut Casinos for the most recent year (2012). This seems like the most similar market but again, a different per slot figure can be entered into the model to yield different results. 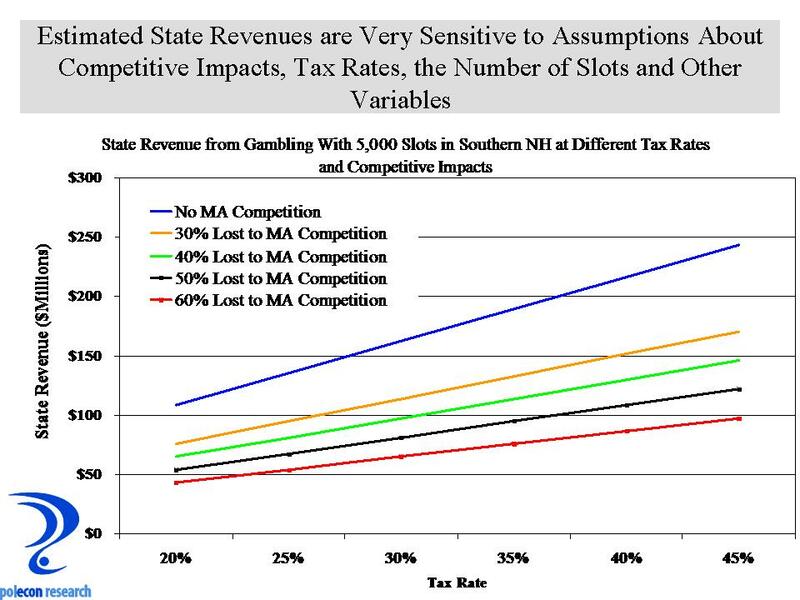 In addition, different tax rates and different impacts from Massachusetts casinos can be entered into the model. I’m not trying to estimate revenues here but I am trying to highlight just how important model assumptions can be in determining fiscal impacts and until all sides show how their estimates are affected by their assumptions I think it is hard for lawmakers to make reasoned decisions based on fiscal impacts. As the chart below shows, estimated state revenues vary greatly when even a few assumptions change. The “Y” or left, vertical axis shows estimated state revenues, and the “X” or bottom, horizontal axis shows increasing tax rates from left to right. Each colored line on the graph shows estimated state revenue at each tax rate and each colored line represents a different assumption about the impact on revenues depending on how much casinos in Massachusetts affect casino revenues in NH. Finally, I would like someone to articulate and provide some data on how casinos in NH would perform in a competitive market depending on the type of experience they provide. That seems to me to be a question best answered by the industry. 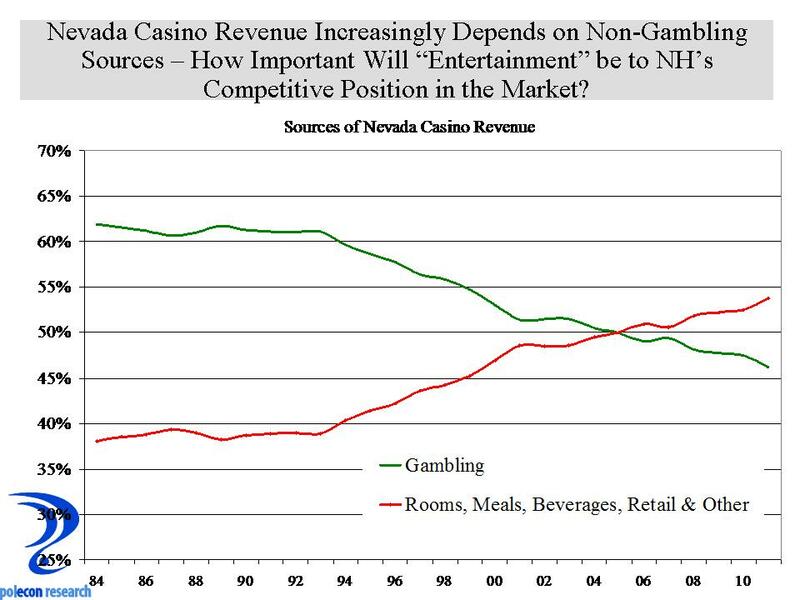 I think it is important in understanding the impacts of an increasingly competitive gambling market and the data I have looked at suggest that, at least in Nevada (see below), casinos have derived an increasing share of their revenues from rooms, meals, beverages, retail and shows. Entertainment seems to play a larger role in the business models of casinos in that state and I wonder if that will be true in NH or in Massachusetts and what are the implications if it isn’t in either, both, or if it is in just one state. This entry was posted on March 5, 2013 at 1:30 pm and is filed under casinos, Gambling, NH, Policy, Tax Revenue. You can subscribe via RSS 2.0 feed to this post's comments. Great question. I probably should have included the raw numbers but it would have required another graphic and more explanatory text in an already too long post. Gambling revenue was increasing, although it was relatively stagnant during the mid 90’s and on an inflation adjusted basis showed slight declines in some years. it does seem that gambling revenues rebounded significantly at about the same time the non-gambling revenues did and that prompted my query because it may have implications for the prospects of any proposed NH casinos. let me know Peter if you would like the raw data. As a recovering Mass hole of 20+ tears, there truly is in something of the magic of buying a scratch card there vs here. We just have addicts like Mass has created, nor do I ever seeing us being equal. I do see prospects for gambling but it must be away from a population center defined by.10k or less. Disclosure: I play power ball some times. Nicely put. We should insist on building legislation on a solid foundation. Projections can be made to look wonderful or awful. If we don’t know or understand the assumptions, we might as well be throwing a dart blindfolded. Our quality of life in this state is way too important to make decisions like this without being very thorough and thoughtful!